Mid Cal Moving & Storage is a trusted Central California moving company offering an extensive array of cost-efficient commercial and residential services. Our professional movers are highly trained professionals who are committed to your comfort and ultimate satisfaction. Whether your move is commercial or residential, large or small, we have the resources, support and experience to make your transition as simple and straightforward as possible. 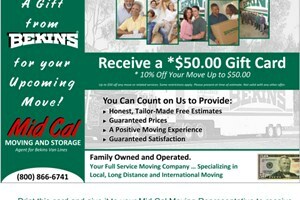 Mid Cal Moving & Storage is a premier local mover in California. Over the years, we've acquired an "A+" rating with the BBB as well as ProMover membership with the California Moving & Storage Association. We're also proud, dedicated agents for Bekins Van Lines, one of the largest carriers in the industry. Our partnership with Bekins allows us to execute pristine local, interstate and even international moves that are safe and efficient. At Mid Cal, we wouldn't have it any other way! For more information on our Central California moving company and the comprehensive services we provide, call us today or fill out the Quick Quote form above for your no obligation estimate.